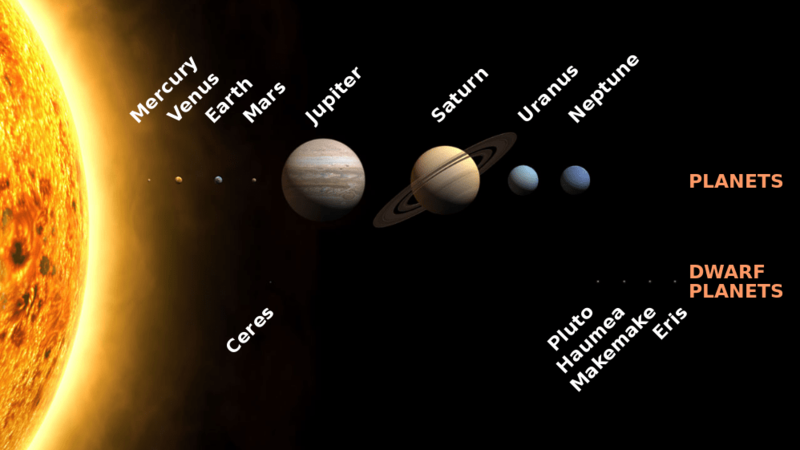 If you add in the dwarf planets, Ceres is located in the asteroid belt between Mars and Jupiter, while the remaining dwarf planets are in the outer Solar System and in order from the Sun are Pluto, Haumea, Makemake, and Eris. There is, as yet, a bit of indecision about the Trans-Neptunian Objects known as Orcus, Quaoar, 2007 O10, and Sedna and their inclusion in the dwarf planet category. A mnemonic for this list would be “My Very Educated Mother Could Just Serve Us Noodles, Pie, Ham, Muffins, and Eggs” (and Steak, if Sedna is included.) You can find more tricks for remembering the order of the planets at our detailed article here. Now, let’s look at a few details including the definition of a planet and a dwarf planet, as well as details about each of the planets in our Solar System. This means that Pluto, which was considered to be the farthest planet since its discovery in 1930, now is classified as a dwarf planet. The change in the definition came after the discovery three bodies that were all similar to Pluto in terms of size and orbit, (Quaoar in 2002, Sedna in 2003, and Eris in 2005). With advances in equipment and techniques, astronomers knew that more objects like Pluto would very likely be discovered, and so the number of planets in our Solar System would start growing quickly. It soon became clear that either they all had to be called planets or Pluto and bodies like it would have to be reclassified. With much controversy then and since, Pluto was reclassified as a dwarf planet in 2006. This also reclassified the asteroid Ceres as a dwarf planet, too, and so the first five recognized dwarf planets are Ceres, Pluto, Eris, Makemake and Haumea. Scientists believe there may be dozens more dwarf planets awaiting discovery. This subcategory includes Ceres, Pluto, Haumea, Makemake, and Eris. Having covered the basics of definition and classification, let’s get talking about those celestial bodies in our Solar System that are still classified as planets (sorry Pluto!). Here is a brief look at the eight planets in our Solar System. Included are quick facts and links so you can find out more about each planet. Length of Day: 59 Earth days. Mercury is a rocky planet, one of the four “terrestrial planets” in our Solar System. Mercury has a solid, cratered surface, and looks much like Earth’s moon. If you weigh 45 kg (100 pounds) on Earth, you would weigh 17 kg (38 pounds) on Mercury. 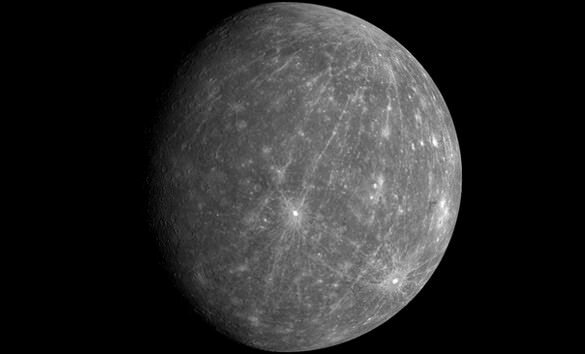 Just two spacecraft have visited Mercury: Mariner 10 in 1974-75 and MESSENGER, which flew past Mercury three times before going into orbit around Mercury in 2011 and ended its mission by impacting the surface of Mercury on April 30, 2015. MESSENGER has changed our understanding of this planet, and scientists are still studying the data. Find more details about Mercury at this article on Universe Today, and this page from NASA. Venus is the second closest planet to our Sun, orbiting at an average distance of 108 million km (67 million miles) or 0.72 AU. Venus is often called Earth’s “sister planet,” as it is just a little smaller than Earth. Venus is 81.5% as massive as Earth, and has 90% of its surface area and 86.6% of its volume. The surface gravity, which is 8.87 m/s², is equivalent to 0.904 g – roughly 90% of the Earth standard. And due to its thick atmosphere and proximity to the Sun, it is the Solar Systems hottest planet, with temperatures reaching up to a scorching 735 K (462 °C). To put that in perspective, that’s over four and a half times the amount of heat needed to evaporate water, and about twice as much needed to turn tin into molten metal (231.9 °C)! Venus’ thick and toxic atmosphere is made up mostly of carbon dioxide (CO2) and nitrogen (N2), with clouds of sulfuric acid (H2SO4) droplets. Venus spins backwards (retrograde rotation), compared to the other planets. This means that the sun rises in the west and sets in the east on Venus. If you weigh 45 kg (100 pounds) on Earth, you would weigh 41 kg (91 pounds) on Venus. Venus is also known and the “morning star” or “evening star” because it is often brighter than any other object in the sky and is usually seen either at dawn or at dusk. Since it is so bright, it has often been mistaken for a UFO! More than 40 spacecraft have explored Venus. The Magellan mission in the early 1990s mapped 98 percent of the planet’s surface. Find out more about all the missions here. Find out more about Venus on this article from Universe Today, and this page from NASA. Our home, and the only planet in our Solar System (that we know of) that actively supports life. Our planet is the third from the our Sun, orbiting it at an average distance of 150 million km (93 million miles) from the Sun, or one AU. Given the fact that Earth is where we originated, and has all the necessary prerequisites for supporting life, it should come as no surprise that it is the metric on which all others planets are judged. Surface temperature: Average is about 14 C, (57 F), with ranges from -88 to 58 (min/max) C (-126 to 136 F). Earth is another terrestrial planet with an ever-changing surface, and 70 percent of the Earth’s surface is covered in oceans. Earth’s atmosphere is 78% nitrogen, 21% oxygen, and 1% various other gases. Earth is the only world known to harbor life. Find out more about Earth at a series of articles found here on Universe Today, and on this webpage from NASA. Mars is the fourth planet from the sun at a distance of about 228 million km (142 million miles) or 1.52 AU. It is also known as “the Red Planet” because of its reddish hue, which is due to the prevalence of iron oxide on its surface. In many ways, Mars is similar to Earth, which can be seen from its similar rotational period and tilt, which in turn produce seasonal cycles that are comparable to our own. The same holds true for surface features. Like Earth, Mars has many familiar surface features, which include volcanoes, valleys, deserts, and polar ice caps. But beyond these, Mars and Earth have little in common. The Martian atmosphere is too thin and the planet too far from our Sun to sustain warm temperatures, which average 210 K (-63 ºC) and fluctuate considerably. Length of Year (Orbit): 687 Earth days. Length of day: 24 hours 37 minutes. Mars is the fourth terrestrial planet in our Solar System. Its rocky surface has been altered by volcanoes, impacts, and atmospheric effects such as dust storms. Mars has a thin atmosphere made up mostly of carbon dioxide (CO2), nitrogen (N2) and argon (Ar).If you weigh 45 kg (100 pounds) on Earth, you would weigh 17 kg (38 pounds) on Mars. Mars has two small moons, Phobos and Deimos. Mars is known as the Red Planet because iron minerals in the Martian soil oxidize, or rust, causing the soil to look red. More than 40 spacecraft have been launched to Mars. You can find out more about missions to Mars here.Find out more about Mars at this series of articles on Universe Today, and at this NASA webpage. Jupiter is the fifth planet from the Sun, at a distance of about 778 million km (484 million miles) or 5.2 AU. Jupiter is also the most massive planet in our Solar System, being 317 times the mass of Earth, and two and half times larger than all the other planets combined. It is a gas giant, meaning that it is primarily composed of hydrogen and helium, with swirling clouds and other trace gases. Io and Jupiter as seen by New Horizons during its 2008 flyby. (Credit: NASA/Johns Hopkins University APL/SWRI). Jupiter’s atmosphere is the most intense in the Solar System. In fact, the combination of incredibly high pressure and coriolis forces produces the most violent storms ever witnessed. Wind speeds of 100 m/s (360 km/h) are common and can reach as high as 620 km/h (385 mph). In addition, Jupiter experiences auroras that are both more intense than Earth’s, and which never stop. Jupiter has 67 known moons, with an additional 17 moons awaiting confirmation of their discovery – for a total of 67 moons. Jupiter is almost like a mini solar system! Jupiter has a faint ring system, discovered in 1979 by the Voyager 1 mission. If you weigh 45 kg (100 pounds) on Earth, you would weigh 115 kg (253) pounds on Jupiter. Jupiter’s Great Red Spot is a gigantic storm (bigger than Earth) that has been raging for hundreds of years. However, it appears to be shrinking in recent years. 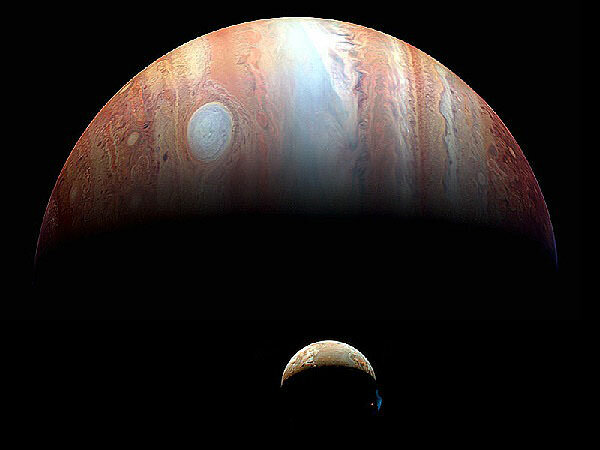 Many missions have visited Jupiter and its system of moons, with the latest being the Juno mission will arrive at Jupiter in 2016. You can find out more about missions to Jupiter here. Find out more about Jupiter at this series of articles on Universe Today and on this webpage from NASA. Saturn is the sixth planet from the Sun at a distance of about 1.4 billion km (886 million miles) or 9.5 AU. Like Jupiter, it is a gas giant, with layers of gaseous material surrounding a solid core. Saturn is most famous and most easily recognized for its spectacular ring system, which is made of seven rings with several gaps and divisions between them. Saturn’s atmosphere is made up mostly of hydrogen (H2) and helium (He). Saturn has 53 known moons with an additional 9 moons awaiting confirmation. Five missions have gone to Saturn. Since 2004, Cassini has been exploring Saturn, its moons and rings. You can out more about missions to Saturn here. Find out more about Saturn at this series of articles on Universe Today and at this webpage from NASA. Uranus is the seventh planet from the sun at a distance of about 2.9 billion km (1.8 billion miles) or 19.19 AU. Though it is classified as a “gas giant”, it is often referred to as an “ice giant” as well, owing to the presence of ammonia, methane, water and hydrocarbons in ice form. The presence of methane ice is also what gives it its bluish appearance. Uranus is also the coldest planet in our Solar System, making the term “ice” seem very appropriate! What’s more, its system of moons experience a very odd seasonal cycle, owing to the fact that they orbit Neptune’s equator, and Neptune orbits with its north pole facing directly towards the Sun. This causes all of its moons to experience 42 year periods of day and night. Most of the planet’s mass is made up of a hot dense fluid of “icy” materials – water (H2O), methane (CH4). and ammonia (NH3) – above a small rocky core. Uranus has an atmosphere which is mostly made up of hydrogen (H2) and helium (He), with a small amount of methane (CH4). 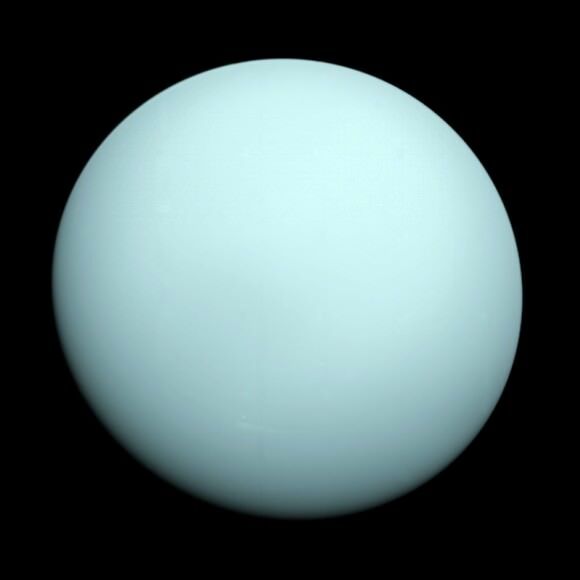 The methane gives Uranus a blue-green tint. If you weigh 45 kg (100 pounds) on Earth, you would weigh 41 kg (91 pounds) on Uranus. Uranus has faint rings; the inner rings are narrow and dark and the outer rings are brightly colored. Voyager 2 is the only spacecraft to have visited Uranus. Find out more about this mission here. You can find out more about Uranus at this series of articles on Universe Today and this webpage from NASA. Neptune is the eighth and farthest planet from the Sun, at a distance of about 4.5 billion km (2.8 billion miles) or 30.07 AU. Like Jupiter, Saturn and Uranus, it is technically a gas giant, though it is more properly classified as an “ice giant” with Uranus. Due to its extreme distance from our Sun, Neptune cannot be seen with the naked eye, and only one mission has ever flown close enough to get detailed images of it. Nevertheless, what we know about it indicates that it is similar in many respects to Uranus, consisting of gases, ices, methane ice (which gives its color), and has a series of moons and faint rings. Neptune is mostly made of a very thick, very hot combination of water (H2O), ammonia (NH3), and methane (CH4) over a possible heavier, approximately Earth-sized, solid core. Neptune’s atmosphere is made up mostly of hydrogen (H2), helium (He) and methane (CH4). Neptune has 13 confirmed moons and 1 more awaiting official confirmation. If you weigh 45 kg (100 pounds) on Earth, you would weigh 52 kg (114 pounds) on Neptune. 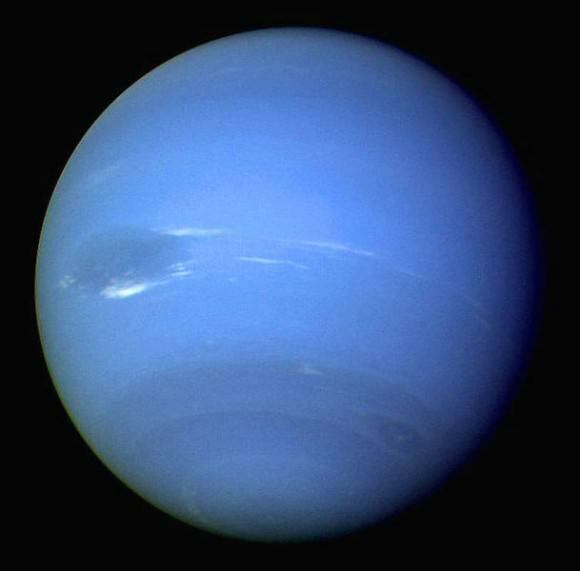 Neptune was the first planet to be predicted to exist by using math. Voyager 2 is the only spacecraft to have visited Neptune. You can find out more about this mission here. Find out more about Neptune at this series of articles on Universe Today and this NASA webpage. We have written many articles about the planets for Universe Today. Here are some facts about planets, and here’s an article about the names of the planets.If you’d like more info on the Solar System planets, dwarf planets, asteroids and more, check out NASA’s Solar System exploration page, and here’s a link to NASA’s Solar System Simulator.We’ve also recorded a series of episodes of Astronomy Cast about every planet in the Solar System. Start here, Episode 49: Mercury.Venus is the second planet from the Sun, and it is the hottest planet in the Solar System due to its thick, toxic atmosphere which has been described as having a “runaway greenhouse effect” on the planet. Now you know! And if you find yourself unable to remember all the planets in their proper order, just repeat the words, “My Very Educated Mother Just Served Us Noodles.” Of course, the Pie, Ham, Muffins and Eggs are optional, as are any additional courses that might be added in the coming years! We have many great articles on the Solar System and the planets here at Universe Today. Here is a rundown of the Inner Planets, the Outer Planets, a description of Terrestrial Planets, the Dwarf Planets, and Why Pluto is no Longer a Planet?. Astronomy Cast also has some cool episodes about the Solar System. Here’s Episode 68: Pluto and the Icy Outer Planets, Episode 306: Accretion Discs, and Episode 159: Planet X. Considering all the other planets have plain optical pictures I think Venus should have one – perhaps in strips with visual, ultraviolet (since there is something to see there), and radar or something…. I’d like to propose that we stop teaching that the Solar System consists of eight “official” planets. Instead, let us start teaching that the Solar System consists of three categories of planets: Terrestrial Planets, Gas Giant Planets, and Dwarf Planets. I was recently approached by an elementary school teacher who was frustrated because she still has students asking “What happened to Pluto.” To make matters worse, because of limited resources, she was obligated to literally tear off the Pluto section of the Solar System handout she used in class. This only reinforced her students perception that (evil) astronomers have taken away Pluto. After spending time discussing this with the teacher, I proposed to her that she teach that the Solar System has different categories or types of planets, with Dwarf Planets (including Pluto) just one category. She loved it! It gave her a whole new way of introducing the Solar System to her students as something much more than eight “official” planets. We spent a few minutes at the computer and produced a Dwarf Planet handout that she will now use when teaching about the Solar System. Pluto has not been taken away; it just has some new friends! Great job! Who forced this teacher to tear Pluto out of the planets section of the solar system? We need to reach out to them, whoever they are, and teach them what you taught this teacher. And an excellent solution to the “Number of actual planets” conundrum. The solar system should be explained and described as the system it is. 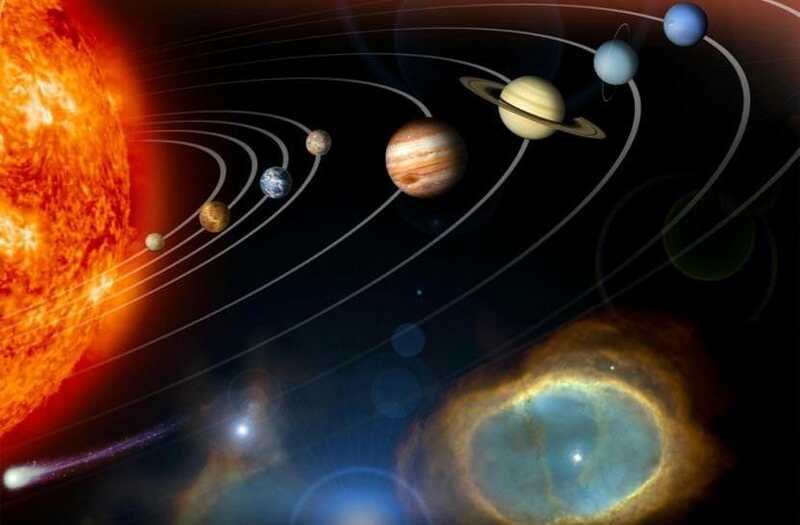 First, a correction: Our solar system does NOT have only eight “official” planets. It has at minimum 14 and counting: Mercury, Venus, Earth, Mars, Ceres, Jupiter, Saturn, Uranus, Neptune, Pluto, Charon, Hauema, Makemake, and Eris. Dwarf planets are planets too; they are a subclass of planets. That was the intention of the person who first coined the term, none other than Alan Stern. The four percent of the IAU who voted on the controversial 2006 definition misused the term Stern created. Unfortunately, you are giving unjustified privilege to the IAU definition, which is just one among several in an ongoing debate. That definition was adopted by 424 out of 10,000 IAU members, most of whom are not planetary scientists but other types of astronomers. This means they are NOT experts in the field of planetary science. The resolution they adopted was done in violation of the IAU’s own bylaws, which prohibits putting a resolution to the floor of the General Assembly without first having it vet by the appropriate IAU committee. The highly flawed IAU definition was immediately rejected by several hundred professional astronomers, a number roughly equal to those who adopted the definition. These scientists prefer the geophysical planet definition, according to which a planet is any non-self-luminous spheroidal body orbiting a star, free floating in space, or even orbiting another planet. If an object is not a star and is large enough and massive enough to be rounded by its own gravity, it is a planet. This definition notably classifies objects first and foremost by their intrinsic properties rather than by their location. There is nothing wrong with the number of solar system planets growing quickly if that is the reality of what is out there. Keeping the number of planets artificially small so people can memorize a list of names or have a cool mnemonic has absolutely NO scientific basis. It is akin to saying Jupiter can have only four moons because no one can memorize the names of 67. Memorization is not important for learning. We don’t ask kids to memorize the names of all the rivers and mountains on Earth, just to know what a river and a mountain are. It is interesting that just as New Horizons is revealing the extent of Pluto’s planetary complexity, defenders of the IAU definition are out in force on the Internet repeating yet again the same justifications they used when first adopting their flawed definition. Simply repeating something over and over and appealing to authority (the IAU) does not make that thing true. Next PostNext Do Comets Explain Mystery Star’s Bizarre Behavior?